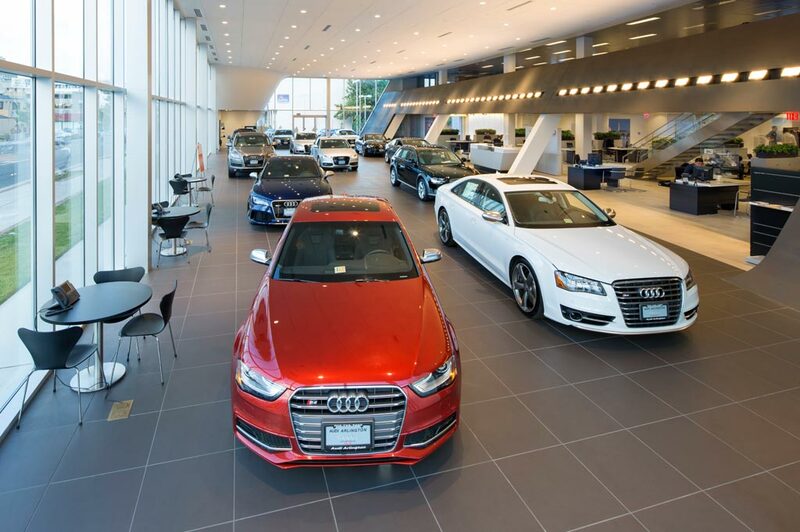 Audi Monterey Peninsula in Seaside, CA treats the needs of each individual customer with paramount concern. We know that you have high expectations, and as a car dealer we enjoy the challenge of meeting and exceeding those standards each and every time. Allow us to demonstrate our commitment to excellence! Our experienced sales staff is eager to share its knowledge and enthusiasm with you. We encourage you to browse our online inventory, schedule a test drive and investigate financing options. You can also request more information about a vehicle using our online form or by calling (831) 920-3705. We are proud to showcase our new facility, designed to create a world class buying experience in Monterey County, please visit us at: 3 Heitzinger Plaza, Seaside, Ca., in the Seaside Auto Mall. We look forward to serving you! Welcome to AUDI MONTEREY PENINSULA in Seaside, CA. Audi of Monterey Peninsula is the premier Audi Center on California's Central Coast. We are fully committed to offering the Most Competitve Pricing at the Highest Level of Customer Satisfaction. Our experienced sales staff is eager to share its knowledge and enthusiasm with you. We encourage you to browse our online inventory, schedule a test drive and investigate financing options. You can also request more information about a vehicle by calling 831-393-AUDI (2834). There's a reason why Audi Monterey Peninsula is a premier new, certified pre-owned and used Audi dealer for Monterey, Santa Cruz, Pacific Grove, Carmel, Pebble Beach and San Benito county, CA. It's because we provide quality automobiles at prices our customers can afford and outstanding customer service. Our knowledgeable staff will answer your questions, help you find the right new car and can assist with financing. So if you're looking for a sports car, luxury car, luxury SUV, exotic car, convertible or new or used Audi in Seaside, stop in to Audi Monterey Peninsula and let's get you into the car of your dreams! Have questions to ask first? Call us at 877-465-6862. Get directions from Monterey, Salinas, Gilroy, Holister, Capitola, Watsonville and Santa Cruz to our new Audi and used car dealership in Seaside, CA. Get a new Audi A3, A4, A5, A6, A7, A8, R8 Q3,Q5 Q7, S4, S5 and more from Seaside's Audi Monterey Peninsula and you'll get a great vehicle at a low price. Our service to you does not end at the sale. Call us at 888-720-5973 anytime with questions. Our entire team at Audi of Monterey Peninsula is here to help. If you're looking to purchase from a dealership dedicated to its customers, come by Seaside's Audi of Monterey Peninsula and experience our service for yourself! Audi Monterey Peninsula has the used car in Seaside, California that you have been searching for. With a variety of used luxury cars, trucks and SUVs in Seaside to choose from and an experienced sales team, we are confident that we can find the vehicle that was built for you. On our Seaside used car lot we feature vehicles by many of today's top automakers. Each used car has been through a detailed inspection by our auto mechanics so that we only stock the highest quality vehicles. Have you been unable to locate a particular used car in Seaside? Fill out our CarFinder form and we will notify you when a matching car arrives at our dealership. For a low interest car loan in Seaside visit our finance department. The Audi Monterey Peninsula Seaside, California car finance team is here to assist you through the entire car loan process. We are the Seaside new and used car dealer that will work to find the finance option that works for you! Start the approval process right now by filling out our secure car loan application online! Audi Monterey Peninsula provides car repairs in Seaside, Audi car parts in Seaside and Audi accessories in Seaside. We staff certified and trained technicians to ensure repairs and maintenance are done correctly. Our Seaside, California car parts team is also very knowledgeable on the Audi brand and will get you the right part to keep your vehicle running like new. The employees at Audi Monterey Peninsula look forward to your visit. Give us a call at 888-720-5973 or use our step by step directions to get here from Monterey, Salinas and Santa Cruz. Audi dealer with unbelievable deals and superior service, Audi Monterey Peninsula.